Funeral Services are available to all, regardless of being a registered member of the Parish. Services may either be a Mass of Christian Burial or a Memorial Mass, depending on the circumstances. Please know that we are here to assist you with the planning of the funeral for your loved one. As with the planning of any Mass, many decisions must be made about options for aspects like music and readings or persons taking part in one way or another. 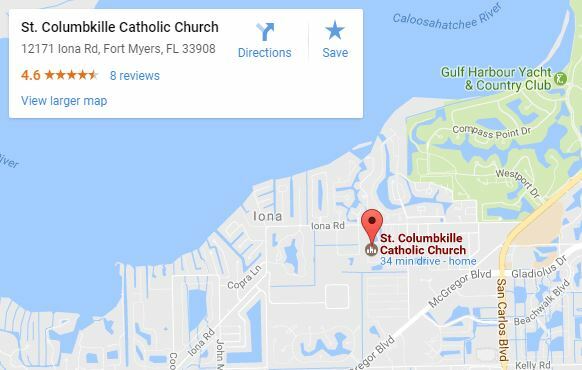 To arrange a funeral at St. Columbkille please call the Parish Office at 239-489-3973. Funerals are scheduled between 10:00am or 11:00am Tuesday through Friday. Funerals may be scheduled at an alternative day or time if facilities and staff schedules permit. Upon the family’s call to the parish, a planning meeting with the members of the family, priest and bereavement coordinator will be established. Discussion of all elements of the funeral takes place at the time. Guidance will be provided. Mass of Christian Burial: Funeral Mass with the Body or Cremains present. The Catholic Church prefers that the body of the deceased be present for Mass. The body of the deceased is to be interred, either in the ground or in a crypt following the Funeral Mass. If the choice to cremate a body has been made for the deceased, the cremated remains should be committed for burial according to the Order of Christian Funerals. The Catholic Church does allow the celebration of the Funeral Liturgy in the presence of the cremated remains of the deceased. The cremated remains should be treated with the same respect given to the human body. Therefore, they should be buried in a grave or entombed in a mausoleum or columbarium. This is the reverent disposition of the cremated remains that the Church requires. Memorial Mass: Mass without the Body or Ashes present. A Memorial Mass is celebrated when neither the body nor the cremated remains are present for the Mass. Family members may elect to set up a remembrance table to include a picture of the deceased, flowers or any other expressions of the deceased person. There are certain differences between the two ceremonies. These differences relate directly to the presence/absence of the remains of the deceased person. Any prayers (such as words about the body or words anticipating a burial) and ritual gestures (such as blessing with holy water) that presume the presence of human remains are omitted from the Memorial Mass. Yet the intention of the two ceremonies is the same, to mark the death of a member of the Church. This is an opportunity for the family to visit with others before the service begins. Visitation time is usually done just prior of the Funeral Mass if the body is present. This is a time for visitation and prayer. It is sometimes done at the Funeral Home. It normally lasts about an hour, and, depending on availability, can also take place in the chapel. The use of Iona Hall is extended to parishioners depending on availability. Family members are responsible for the food, paper products, coffee, drinks, etc. There is no fee for the use of the hall. The family is responsible for the set-up of the food and drinks and the clean up of the hall following the reception. The reception should last no more than 2 hours. There is no fee for a Funeral Mass or a Memorial Service for parishioners, although we do request a donation for the church. Non-parishioners should contact the Parish Office to discuss the fees associated for the Masses. In lieu of flowers families may request monetary donations be directed to the Parish in the name of the deceased. Flowers should be delivered to the Church on the day of the funeral. Following the Mass flowers may be left as a donation to the church for the altar. Music is an integral part of the Funeral Rite. Family members, with guidance from the parish staff, will choose appropriate liturgical music for the funeral. Ordinarily, parish accompanists and cantors lead liturgical music during the funeral. Alternative arrangements will be considered only after consultation with the Director of Music. Some families wish to have a family member or friend offer words of remembrance in honor of the person who died. This is best done at the funeral home during the wake service or afterward at a reception. However, words of remembrance may also be given at the church during the funeral service after the homily. If this option is chosen, one person should be identified as the one to offer Words of Remembrance. It is helpful to have them written out. The words of remembrance may last no longer than five minutes. The Bereavement Coordinator for funeral planning will create a program and will include a photo of the deceased on the cover, readings and music selections. We hope that through our service at this very difficult time, you will find in St. Columbkille Catholic Community a vital support and great testimony of how our Christian spirituality makes a difference. If you are not already a parishioner, perhaps you and your family members would consider joining our Parish family to guide you to the path of growing in faith.